It is undeniable that the female fashion and lifestyle magazine reader of today is spoilt for choice. The abundance of women’s magazines gracing the shelves is phenomenal, sometimes even overwhelming. A visit to the local WH Smiths can last absolute hours and for the enthusiastic reader, can cost a small fortune, or at least a nice lunch. As readers we select our magazines in accordance to the publications that speaks to who we are, or more aptly, who we aspire to be. A wealth of publishers, photographers, editors, writers, stylists and designers want to give readers the opportunity to see the world through their eyes. They are the vocal-chord of fashion, communicating the core ideals of the industry through their voices. With great creative manipulation they use the shiny pages of their glossy magazines to show us how beautiful, respectable, fabulous and glamorous the world of fashion is. These creatives, however, that assure us fashion is global, multicultural, powerful and important, whilst being at the same time and most significantly – fabulous, seem to be less eager to style, write, advertise or photograph ethnic women. London is home to approximately seven million people, known for its great melting pot society. It is the creative hub, rich in cultures, races and lifestyles. There are two and a half million of London’s population living in the capital’s largest borough of Lewisham, half of the population are black. Amongst the assortment of mainstream fashion magazines on display at a Lewisham newsagents it may be possible to spot three or four black women’s lifestyle magazines on the shelf at any one time. This however, does not happen often and when it does, no doubt these newsagents are keen ethnic magazine stockists. There are only but two longstanding UK based women’s lifestyle magazines, Pride, ‘for the woman of colour’ which has been in print for nineteen years and Black Beauty and Hair, ‘for the beauty conscious black woman’, for twenty four years. Acutely looking for these two black ‘lifestyle’ magazines in the Lewisham borough the investigation found it was not always possible to find them on the ethnic magazine stockist’s shelves, however, Jet, Essence, Ebony and Oprah, all of which are black American women’s glossies appeared to be the staple of the such vendors, (of course, whether Oprah is actually a black magazine remains slightly ambiguous). Whether its music tastes, fashion, Hip Hop and basketball subcultures or hair and beauty matters, it is no revelation that black UK culture follows on the heels of America’s dominant black culture, henceforth, 56% of black women claim they are more likely to read a black American magazine than they are a black UK magazine, opposed to 22% who said they would prefer to read a black UK magazine. 22% of black women claimed they wouldn’t read either. The general consensus feels that black American magazines have a more authentic position on black issues and a greater affluent black population than the UK, with ideologies that UK blacks obviously feel they can identify with. Of course the black population is significantly larger in number in America, hence America’s ability to represent blacks better and produce higher quality black magazines that obtain a larger readership in countries outside of its own. ‘I hardly ever see a Pride magazine in my newsagents and Black Hair and Beauty, never,’ says London College of Fashion trained Afro and European hairdresser, Natasha Bonet. For the woman who never buys a magazine, or doesn’t care too much for them, if there is one place that she is certain to at the least flick through one, it’s at the hairdressers. Most hairdressers spend ample amounts of money on magazines and most black women spend ample amounts of time at the hairdressers. Natasha runs a private boutique hairdressing service in Forest Hill, Lewisham. Her clientele are by referral only. Ninety nine percent of them are black women, who she describes as mature professionals or young upwardly mobile. In the magazine rack in her salon she has Vogue, Glamour, Look, Elle, Marie Claire and OK – all the mainstream glossies you can think of, but not a black magazine in sight, not even a black hair magazine. In this boutique salon, that is, without claiming to be, a posh black hairdressers, even the hair magazines are white hair magazines. If there is a formula for the survival of the black publication it most certainly involves saturating it with black hair editorial, advertorial and adverts. In fact there are more black hair magazines than there are lifestyle magazines and even those lifestyle magazines are filled with hair products and adverts. Hawker publications, publisher of Black Beauty and Hair magazine also publishes Braids and Naturals, Black Hairstyles and Black Beauty and Hair professional, their media pack says, ‘Black Beauty and Hair has a high pass-on readership because it is the top choice magazine for salons,’ evidently not for this boutique salon. Many believe that the difficulties that black magazines face are self inflicted, the publications feature poorly edited articles that are neither topical or engaging, the photography at best appears somewhat defective and substandard and the styling and make up, just the same. Of course the quality is a knock on effect of the circulation and advertising rates. Black magazines are a specialist, niche magazine, an alternative to the mainstream magazine, yet they need mainstream readership figures to create the revenue they need to level with the quality of any mainstream glossy, however the black magazine must remain niche, to remain a black magazine. Ed Davies, managing editor of American newspaper, the New Pittsburgh Courier says, ‘Black newspapers are caught in a quality –revenue “Catch 22.” Black newspapers need to hire additional reporters and editors and purchase computer systems and other equipment to improve the quality of their products and attract more readers. More readers will bring in more advertising, which brings in more revenue to further operations.’ Advertising has an insurmountable impact on the survival and production of the magazine, as this is where the publication will generate a significant amount of its revenue. However advertisers markedly are more attracted to advertising their products in magazines with more impressive readership figures, as this creates greater exposure for their product. Mainstream magazines unmistakably provide a more lucrative platform than any niche magazine because the readership figures are greater. ‘Many ethnic magazines are niche products and their publishers should perhaps spend more time promoting the quality of their target readership rather than worrying about the quantity when trying to woo advertisers,’ says Media Week. Some advertisers claim they are reluctant to advertise in ethnic magazines, some publications aren’t ABC certified (Audit Bureau of Circulations) and publishers swell their readership and circulation figures. Pride has a regular monthly print of 200,000 with a readership of 40,000. Black Beauty and Hair has a regular print of 30,000, how many people actually read Black Beauty and Hair is ambiguous, however Black Beauty and Hair claims to be the biggest selling black UK magazine in WH Smiths and generates the most advertising revenue. On the complete other end of the scale, Vogue has a total paid circulation of 1,240,800. Magazines such as Vogue can sell advertising space to Versace, Chanel, Christian Dior and Prada and each fashion house has a number of adverts in one edition, advertising various products, from sunglasses, watches, and perfume, to make up, handbags, shoes and clothes. The quantity of adverts in such magazines can be grating for some, in Vogue March 2010, there are fourteen double spread adverts, which totals twenty eight pages, not including the Louis Vuitton double sided fold out, before even getting to the contents page. How does Vogue get away with it? The adverts are beautiful, as are the models, but most importantly they can afford to balance their high fashion adverts with high quality stylists, editors, photographers, features and journalists and for such a reason, their readers are prepared to pay a little extra for the cover price. Black Hair and Beauty and Pride magazine, the closest equivalent to a glossy magazine, on the other hand fight to secure advertising that can generate sufficient funds to improve the magazine’s quality. Black magazines cannot attract mainstream advertisers, Versace has never advertised in Pride magazine and neither has H and M. Media Week claims that, ‘the difficulty for advertisers is that ethnic communities can be as internally diverse in terms of age, language and location as they are distinct from mainstream culture. Add this to a client team’s possible lack of understanding of ethnic cultures and a fear its brand image will be damaged if a company gets its advertising message wrong, and it is perhaps understandable that many advertisers and their creative agencies prefer to stick with the mainstream media they know so well.’ Surely then United Colours of Benetton must have mastered this art, then? 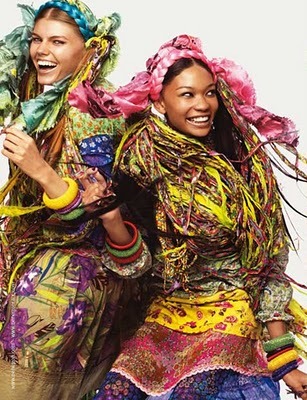 The brand prides itself on its diversity and features models of nationalities from all over the world, Alek Wek being a household Benetton model. However, according to the United Colours of Benetton press area the brand hasn’t advertised in either of the major black magazines in the past year and undoubtedly, ever. The truth is, regardless of what Media Week claims about ABC certificates and a team’s lack of ethnic understanding, advertisers don’t consider black consumers to be significant enough to target them solely. David Hatchett quotes a black American media figure, Warren, ‘Many businesses do not advertise in black newspapers because they are not overly important to their marketing strategies in the black community.’ Advertisers are also aware that they can reach the black market through mainstream magazines, as black frequent magazine consumers read mainstream magazines more frequently than black magazines. 86% of black upwardly mobile women under forty read mainstream magazines as opposed to black magazines, 10% of these women said they might buy a Black Beauty and Hair magazine to refer to when getting their hair done. So what kinds of adverts end up gracing the pages of black magazines? In Pride’s May 2010 edition, seventeen pages of seventeen different brands are dedicated to hair adverts, two double spread adverts, (two brands, four pages) appear before the contents page, in comparison to Vogue’s fourteen adverts, twenty eight pages. Pride evidently has fewer brands to advertise in its publication; out of forty pages dedicated to advertising and seventeen hair adverts, the remaining twenty three pages are dedicated to churches, foster care, community events, black Businesses and organisations and black album releases. The lack of advertisers willing to advertise their brands in black magazines leads to black publications being forced to depend on black businesses, government projects and inevitably, black hairdressers. You wouldn’t be wrong to assume when reading Black Beauty and Hair or Pride, that black women have but one issue in their lives – beauty. ‘It’s embarrassing, surely we have progressed a little more than this, or are we still seeing our beauty through the eyes of European standards? It’s a shame black history can’t generate more advertising revenue,’ Gemma Ellen says, disappointedly. 89% of black women claim that they do not get sufficient information from UK black magazines, 78% claim they don’t feel they get sufficient information from mainstream magazines either. 75% think that mainstream magazines should diversify and would prefer to see a more diverse and integrated mainstream magazines as opposed to black UK magazines becoming fruitfully successful within their own specialist niche. Only 25% feel mainstream magazines are created to represent the majority and are fulfilling their remit perfectly, they believe it is the black UK magazines responsibility to satisfy black women. 100% of women feel that the black UK magazine is completely necessary for black women living in this country. Although the obvious differences between blacks and Caucasians are hair and beauty related, the disparity isn’t just skin deep, black women feel that the black UK magazines should feature editorial that mainstream publishers won’t publish, such as cultural and social issues, they also feel strongly about covering editorial focused on black history. Instead what black women end up with is something that resembles the yellow pages of hair, an index of black hair salons, photography of black hair styles and hair stylists (which also advertise black hair salons) and page after page of black hair products. It is overwhelmingly tedious to sieve out any editorial that isn’t advertising or writing about black beauty issues or hairdressers. Black Beauty and Hair’s photography is cleverly disguised, at a first glance you may think the photography is the cultivated vision of the magazine, makeup artists, hairstylists, stylists, photographers and the creative director coming together to create something which captures the essence of the magazine, however you would be mistaken. A source reveals that Black Beauty and Hair magazine have nothing to do with the production of the pages of photography, ‘hairdressers arrange their own photography, send it over to the magazine, who advertise their salon on the page. The magazine doesn’t actually do any photo shoots.’ The magazine’s offices, or office, to be apt is just as non impressive; one office, three desks, no more than a handful of computers and on that particular visit, two members of staff. David Hatchett says, ‘Another yoke around the necks of the black newspapers is the continuous movement of the better black editors and reporters from black newspapers to better paying jobs at white-owned newspapers.’ So, which black journalist, with the possible power to begin the resolution of the black magazine predicament aspires to work for such publications? It is rumoured that the editor of Pride magazine has no journalistic qualifications and Black Beauty and Hair doesn’t appear to have the need to employ anyone that isn’t working on a sales and commission basis. Aspiring black journalists ultimately want exposure, they want their work to be read, accredited and critically acclaimed, understandably they want to receive the big bucks, the aspiring black journalist wants to write for a mainstream publication. However it would appear that there is a change slowly developing and it has begun by marketers and advertisers recognising the black beauty market share. Cosmetic brands such as MAC, Bobbi Brown and Clinique cater for a greater range of skin colours and therefore nationalities than most mainstream brands and reflect this in their advertising campaigns. MAC has featured black celebrities such as Missy Elliott and Mary J. Blige in their campaigns. Clinique and Bobbi Brown both frequently cast models of various nationalities. All three brands are regularly in the editorial of Black Beauty and Hair and Pride. Both MAC and Clinique have adverts in the May 2010 edition of Pride; Clinique has a double page spread, the only double page spread advert throughout the entire magazine, barring two hair adverts. MAC has a single page advert which features Lady Gaga. These are, however, the only mainstream adverts in the magazine, whose products cannot be bought at the local pharmacy, such as Vaseline or Cocoa Butter. On the other side of the coin, ‘Superdrug is the first high street retailer to throw its weight behind an ethnic cosmetics brand, by stocking Sleek Make UP in more than 100 stores nationwide. Like the rest of the retailers, Boots sells only a small number of ethnic brands in selected stores,’ says Mintel.Fashion retailer Next revamped its brand in 2007 and made mixed race, Brazilian born Emanuela de Paula its household model. In turn Marie Claire has notably begun to diversify their subject matter and identify with their readers beyond the black token celebrity on the cover; Emanuela de Paula features in the fashion spread of the June 2010 edition, which introduces The New Black, which describes itself, in the words of Marie Claire, as being ‘all about black beauty.’ In actual fact, it’s a page with four hair and makeup tips written by black fashion and beauty writer and editor of Brownsfashion.com, Funmi Odulate, nevertheless this definitely shows the black Marie Claire reader that she is being acknowledged. What brought on this change? In a word – money. According to Carole White, co-founder of Premier Model Management, ‘Black models do not sell,’ (unfortunately she made this statement before the Vogue Black is Beautiful edition was released, which flew off the shelves and had to go into print twice). It may be the general media consensus that black models do not sell, but black women most certainly consume. Mintel reports inform marketers and advertisers that the black female consumer is a valuable and untapped market, with a thriving consumer base that can make a significant boost to product sales. ‘Ethnic make-up, skincare and hair care is a niche market worth £65 million in 2007, growing by 18% since 2002. However, the ethnic beauty products market has not kept pace with population growth, due to a lack of impactful new product activity and limited distribution opportunities. Market growth is hampered by limited availability of ethnic brands on the high street. Ethnic brands are losing sales to mainstream cosmetics and toiletries brands as ethnic women turn to a wider range of brands to meet their beauty and personal care needs,’ Mintel reports. However, advertisers are already aware of the fact that they don’t need to advertise in black publications to contact the black market share as more black women read mainstream magazines as opposed to black magazines anyhow. Should diversification of mainstream magazines occur, it would be more likely to render the adverts that are currently limited to black magazines being advertised in mainstream glossies. This would inevitably lead to mainstream magazines hiring more black journalists. Black readers already lost for reasons to purchase the black UK magazine, in this instance will no longer have any need to do so, whatsoever. Whether Vogue will ever sell advertising space to Sensationnel is debatable, however, if black magazines are already struggling to stay above board and are doing so without being entirely respected by the black population, the diversification of mainstream magazines could lead to the complete demise of the black magazine, the magazine that black women feel is totally necessary to the UK. If what black women want is the choice between a good UK black magazine and a mainstream magazine then ultimately they need to begin by purchasing the black UK magazine and remaining loyal consumers. Only then will the revenue be generated to improve the quality of production, the increased advertising rates and a better editorial content – but until the black woman’s market becomes a market that can solely be communicated to via its own channel, Versace will never cast a black model and will never advertise in Pride magazine.And how does this affect the black magazine? The impact can be vast. Primarily, the more this niche market is recognised, the more marketers will want mainstream products to tap into it, this will initiate the diversification in the advertising of mainstream products, possibly employing more black creative advertisers to create more ethnically diverse advertisements, requiring the casting of more black models. Needless to say, such adverts would fit aptly in the black magazine and conclusively give the black magazine its lifeline; a continuous flow of mainstream advertisers. At long length this should precipitate greater readership figures, possible higher advertising rates and a requirement for better black journalists, photographers, editors and staff in general, creating a significantly more attractive magazine for readers, advertisers and prospective employees. It sounds all a bit pie in the sky, but may be less far off than some may realise. The past two years have seen two Vogue Italia editions celebrating blackness in one way or another, in 2008 Vogue Italia created the The Black Issue, in 2009 Vogue Italia celebrated Barbie’s fiftieth anniversary by creating an edition which consisted of back to back pages of photography of black Barbies only, titled The Barbie Issue. Vogue Italia has even gone that one step further and has a residential section on their website entitled Vogue Black, which devotes itself to the black Vogue reader. Vogue Black is written in English and features black writers from Italy, New York, London and Paris. The site discusses black issues, photos black women and features black celebrities and models. *It is to be noted that since this investigative feature was written Marie Claire’s The New Black appears to have dropped off the pages since its November edition. *Boots now stocks a number of black beauty products. *Toni and Guy and Pantene have developed products for afro hair. Barthes, R. (2005). The Language of Fashion. Greater London: Berg. Black Beauty and Hair. (2009). Black Beauty and Hair . Black Beauty and Hair Media Kit. (n.d.). Black Beauty and Hair. Burton, G. (1997). More than Meets the Eye. New York: Arnold Publishers. Carter, M. (2003). Fashion Classics from Carlisle to Barthes. Berg. Craig, M. (2002). Ain’t I a Beauty Queen. OUP USA. Crofts, A. (2002). The Freelance Writers Handbook. London: Piatkus. Hennessy, B. (1989). Writing Feature Articles. London: Heinemann Professional Publishing. Larsen, N. (1992). Passing, Quicksand and The Stories. In N. Larsen, Passing, Quicksand and The Stories. New York: Random House Inc.
Odulate, F. (2010). Marie Claire. The New Black , 225, 232. Pride Magazine. (May 2010). Pride Magazine . Pride Magazine Media Kit. (n.d.). Retrieved 05 01, 2010, from Pride Magazine. Purdy, D. L. (2004). The Rise of Fashion. Minnesota: University of Minnesota Press. Quinn, C. (2009). How to Pitch and Sell a Freelance Feature. London: Methuen. Rooks, N. M. (1996). Hair Raising, Beauty Culture and African American Women. In N. M. Rooks, Hair Raising, Beauty Culture and African American Women (p. 34). Brooklyn: Rutgers University Press. Rubinstein, R. P. Dress Codes. Westview Press. Scranton, P. (2001). Beauty and Business. New York : Routledge. Taggart, C. (2010). Writers Market UK and Ireland. Cincinatit: D & C.
Vogue. (2010). Vogue March . Wilson, E. (2003). Adorned in Dreams. London: I.B Taurus. I love this post and I adore your blog! This is really great!